Art History News: *Post-War and Contemporary Art Evening Sale on 6 March 2019 at Christie’s in London. David Hockney’s double portrait of Geldzahler, a curator at The Met, and his partner, painter Christopher Scott, helped to secure his reputation. In March this masterpiece from the Barney A. Ebsworth Collection will be offered in London. In 1968, the 30-year-old painter David Hockney began a series of seven monumental canvases, each 7 ft by 10 ft. These paintings would consume him for the next seven years and come to define his career. The series, which began with paintings of the English writer Christopher Isherwood and his partner, the American artist Don Bachardy, and the American collectors Fred and Marcia Weisman, has come to be known as Hockney’s ‘Double Portraits’. 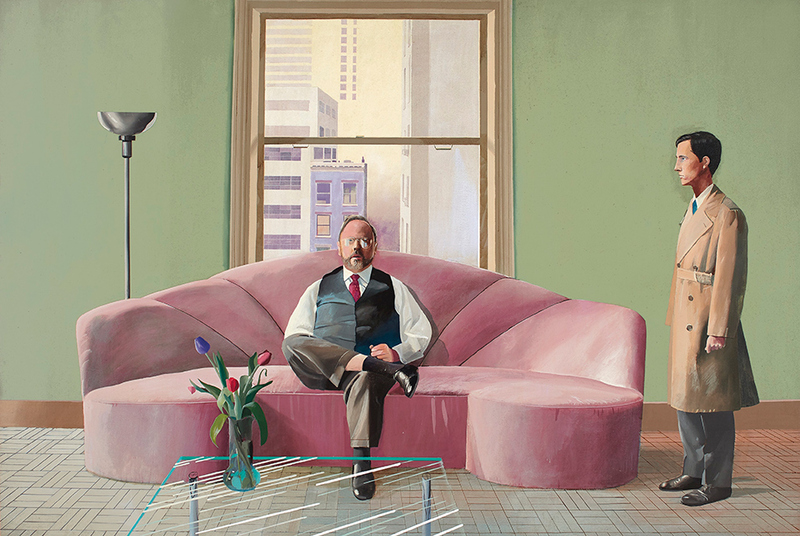 Each depicting a pair of sitters (mostly absent from one another’s attention), they are set in domestic locations and painted in the bold, Pop Art palette that Hockney adopted after his arrival in California in the early Sixties. Inspired by this newfound discourse, Hockney was already planning a third double portrait by October, depicting his friend, the influential curator Henry Geldzahler, and his partner Christopher Scott. ‘It’s a watershed painting’, said Geldzahler. ‘In this picture David finally gave up the idea of being a “modern artist” and decided, instead, to be the best artist he could be’ (H. Geldzahler, quoted in P. Richard, ‘The Painter and His Subject’, The Washington Post, 30 March 1979, p. 8). LONDON – On 6 March 2019, Christie’s Post-War and Contemporary Art Evening Auction will be led by David Hockney’s intimate yet monumentally-scaled 1969 portrait of Henry Geldzahler and Christopher Scott, from the collection of Barney A. Ebsworth (estimate in excess of £30 million). Standing among Hockney’s most celebrated works, Henry Geldzahler and Christopher Scott will mark a fitting conclusion to the collection of Barney A. Ebsworth, which has thus far achieved a running total of $323,508,250. The painting will be unveiled and on view in New York from 8 to 12 February before going on view in London from 2 to 6 March 2019. The Post-War and Contemporary Art Evening Auction is a key part of 20th Century at Christie’s, a season of sales taking place in London from 22 February to 7 March 2019. Henry Geldzahler and Christopher Scott is a glowing meditation on human and visual relationships. Hockney’s closest friend Henry Geldzahler – the legendary curator, critic and king of the New York art world – dominates the centre of the composition, framed by soaring skyscrapers. Christopher Scott, his then-boyfriend, hovers to the right like a fleeting apparition. Painted in 1969, it is the third work in the career-defining series of seven double portraits that Hockney created between 1968 and 1975. With four held in museum collections, these seven-by-ten-foot canvases represent the culmination of the artist’s naturalistic style. Another example from this series, Portrait of an Artist (Pool with Two Figures), was sold at Christie’s New York in November 2018 for $90.3 million, setting a new world auction record for any work by a living artist. Though focused on Geldzahler and Scott, the work ultimately celebrates the relationship between Geldzahler and Hockney: two artistic giants at the heights of their powers. Geldzahler stares out from the canvas like an icon at the centre of an altarpiece, observing the painter’s every move. Hockney’s return gaze is palpable in the work’s sharp, clear perspective, and seemingly affirmed by the addition of tulips – his favourite flower, and a deeply personal motif. The pair met in Andy Warhol’s studio in 1963, and quickly became friends. At the time of the painting, Geldzahler – a curator at the Metropolitan Museum of Art – was working on his landmark exhibition New York Painting and Sculpture: 1940-1970, which quickly came to be known as “Henry’s Show”. This revolutionary survey of contemporary American art would ignite his career, leading one journalist to describe him as ‘the most powerful and controversial art curator alive’. 2019 will mark the 50th anniversary of Geldzahler’s landmark exhibition. Hockney, too, was on the brink of international acclaim, buoyed by the success of the double portraits that he had already completed. The work’s provenance, along with its extensive exhibition history, is exceptional. In 1969, it was unveiled in Hockney’s solo show at André Emmerich Gallery, where it was described as ‘truly amazing’ and ‘totally hypnotizing’ by New York Magazine (J. Gruen, ‘Open Window’, New York Magazine, 12 May 1969, p. 57). It was acquired from the gallery that year by Harry N. Abrams, the renowned art book publisher and distinguished collector, and remained in his family collection until 1992. Under this stewardship, it was featured in a number of significant exhibitions, including Pop Art Redefined – one of the earliest shows at the newly-founded Hayward Gallery in 1969. In 1997, it became one of the final pieces to enter the prestigious Ebsworth collection, offering a rare British addition to one of the world’s greatest assemblages of 20th century American art. Long admired by the collector, it took its place alongside Edward Hopper’s 1929 masterpiece Chop Suey, as well as important works by artists such as Willem de Kooning, Jackson Pollock and Georgia O’Keefe. For twenty-two years, the painting hung in Ebsworth’s home, and starred in notable museum shows – most recently Hockney’s eightieth birthday touring retrospective originating at the Tate Britain, London (2017-18). In an auction world first, the sale of the Ebsworth Collection marks the first time an art auction at this price level has been recorded on a blockchain. Christie’s and Artory, a leading art-centric technology provider, partnered to create a secure digital registry for the sale of the Ebsworth Collection, in the spirit of the innovation and entrepreneurship that guided Mr. Ebsworth career. The introduction of this technology for this sale continues Christie’s legacy of leading the industry by introducing technology innovations in the context of major collections, for the ultimate benefit of our clients. David Hockney’s Henry Geldzahler and Christopher Scott, will be recorded along with all other lots sold as part of the Ebsworth collection. Further details of the collaboration are included here.